SAE national’s staff notified the College after receiving the reports of hazing, Lawrence confirmed. SAE national also immediately issued a cease and desist order to the College’s chapter on Oct. 9, which mandated that the fraternity suspend all activity — namely, hosting events — while the investigation is ongoing, SAE media spokesperson Brandon Weghorst said. 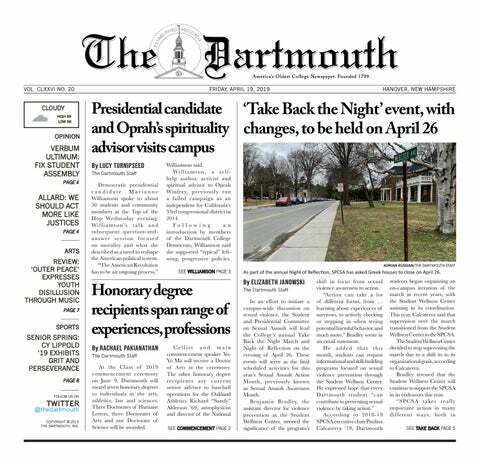 The College subsequently notified Hanover Police about these allegations, and an ongoing investigation of the fraternity has been underway since Oct. 20, Hanover Police Chief Charlie Dennis said. Dennis said the investigation is examining an alleged criminal act of hazing and that the specific nature of the hazing is part of the investigation. He also said whether or not individuals are liable is under investigation. The College’s hazing policy defines hazing as any act directed toward a student, or any coercion or intimidation of a student to perform or participate in an act likely to cause physical or psychological injury to any person, and if the act is a condition of initiation or admission into, continued membership in or association with any organization. The policy continues that this definition applies whether or not the act is considered voluntary. Weghorst said that members who do not comply with SAE national’s stringent health and safety program guidelines will be sanctioned accordingly. “We have a zero-tolerance policy for any actions or behaviors that deviate from our policies, mission and creed — because that type of conduct is unacceptable,” Weghorst said. Weghorst added that fraternity chapters that do not fulfill SAE’s mission will face immediate repercussions. Dennis said Safety and Security is not involved in the Hanover Police Department’s investigation. Safety and Security director Harry Kinne said that his department was not at liberty to comment on the ongoing investigation. Hanover Police will be contacting fraternity members and officers to request interviews, which Safety and Security officers will attend when possible. Assistant director of judicial affairs Katharine Strong sent a formal notice that Dartmouth is cooperating with the police investigation to SAE president Adam Grounds ’16 and other members of the fraternity on Nov. 11. Weghorst said that SAE has sponsored an anti-hazing hotline for several years, and earlier this year created a new anonymous hotline whereby students could call anonymously to report any offensive, inappropriate or illegal matters or behaviors to the national organization. Weghorst emphasized that this measure to eradicate such behaviors — and that people take advantage of these efforts — is an integral part of ensuring the integrity of SAE’s national organization. He did not say whether or not the hazing allegations for the College’s chapter were made through such a hotline. This investigation marks the second hazing allegation at the College this year, after Alpha Delta fraternity was derecognized this past spring by the College following charges that its new members were branded. The College found that AD had violated the terms of its probation and violated College policy. Weghorst said that with SAE, and Greek life organizations more generally, the actions of a few can provide challenges that affect the public perception of the house more generally. “We have a lot of chapters that are doing great things all the time, but that doesn’t get attention…a lot of people have challenged the Greek system in America, but for people who do it correctly it can be a very meaningful experience,” Weghorst said. Grounds did not respond to request for comment. Interfraternity council president Sam Macomber ’16 and public relations and outreach chair James Verhagen ’16 did not respond to request for comment at press time. Director of judicial affairs Leigh Remy declined to comment and instead deferred request for comment to Lawrence. Associate dean for student life Eric Ramsey declined to comment on the premise that the investigation is ongoing. Vice provost for student affairs Inge-Lise Ameer did not respond to request for comment at press time. SAE chapter advisor Jim Morgan ’82 declined to comment. Chapter advisors Clark Griffiths ’57, Jeremy Katz ’95 and Ken Holmes ’81 also did not respond to request for comment at press time.